Pianist/singer Joe Liggins and younger brother, guitarist/singer Jimmy Liggins didn’t record together. They each had impressive and hit laden careers apart. Joe made history with “The Honeydripper” which sat at #1 on the R&B; charts for over 10 weeks in 1945, while Jimmy’s biggest R&B; hit was “Drunk” in 1953. This week, Matt The Cat focuses on both brothers, who contributed greatly to the R&B; scene of the late 40s and early 50s. James Burton on Rockabilly Thursday! This picture was taken in 1959 at a Ricky Nelson show in Seattle by Virginia Houser. There’s a young James Burton burnin’ up on guitar. 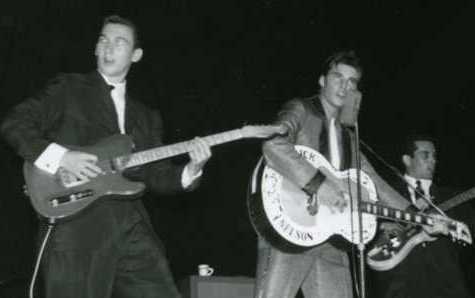 By 1959, at almost 20 years old, James Burton was already a pro. He had already worked with Bob Luman, Dale Hawkins and Ricky Nelson. This week, the Night Prowl presents a very special Rockabilly Thursday as our Rockabilly guitar hero, James Burton joins us as special guest. Hear all about what it was like to play Rockabilly in the heyday of Rockabilly by a cat who was not only there, but was also shaping the way Rock n’ Roll guitars were being played. Harlem: Week Of 5/19/08 – Harlem Undercover! This week, Matt The Cat puts on an overcoat for…. Harlem Undercover reveals the original R&B; versions of songs that were later made famous by others as “cover” songs. Hear the original R&B; version of “Rock This Joint” from Jimmy Preston, released a full 3 years before Bill Haley and The Saddleman’s cover. Everybody knows Mel Carter’s weepy 1965 hit “Hold Me, Thrill Me, Kiss Me”, but have you ever heard the Orioles’ version? Matt The Cat brings you the story under the “covers”, this week on HARLEM.